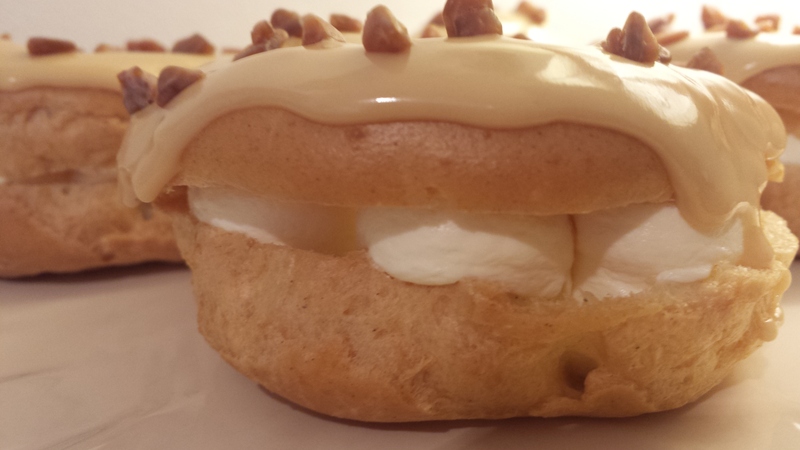 Sometimes I get a craving for a yummy fresh cream-filled treat, and today was one of those days. Normally I’d quickly bake up a Victoria sponge and cram it with cream and strawberries, but today I wanted something lighter. 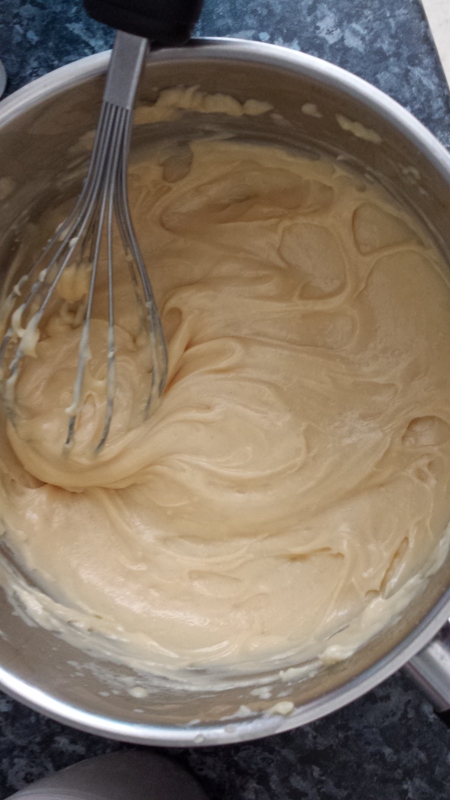 I love making choux pastry. There’s something strangely satisfying about watching something pale and flat puff up into a golden cloud of scrumptiousness. I’ve tried a few different recipes, but this one is my favourite. Preheat oven to 200C or 180C fan oven. Grease and line a baking sheet with parchment paper. (Greasing the sheet keeps the paper nicely in place. Do not grease the top of the paper). 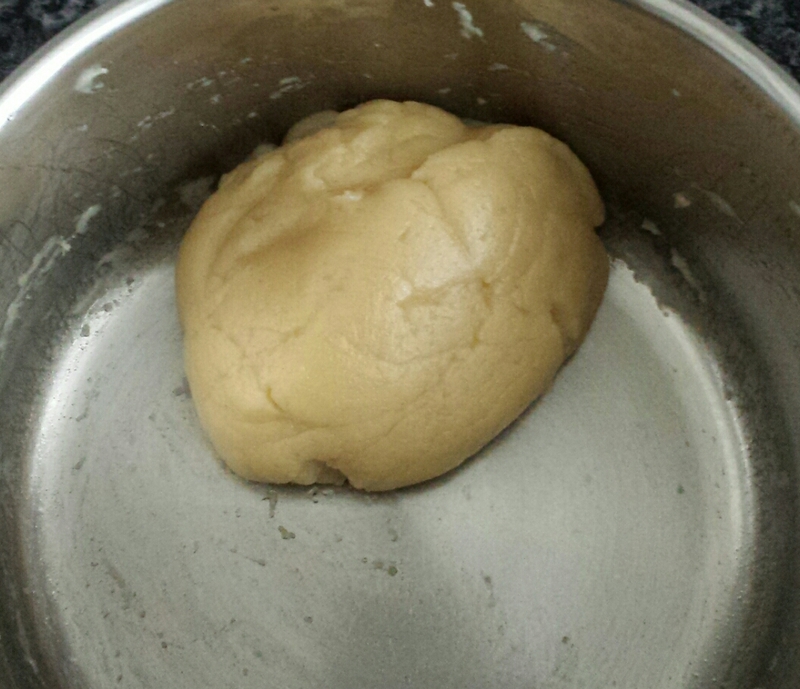 Put the butter and water in a medium-sized saucepan, and place on a medium heat until the butter has melted. Let it come to a boil, then remove from the heat. Leave to cool for 5 minutes. This is important or you will end up with a scrambled egg mixture in the next part! You can use this pastry mixture any way you want… spoon small mounds on to the baking sheet to make profiteroles, or pipe lines to make eclairs. I used a large round nozzle to pipe rings on to the sheet. 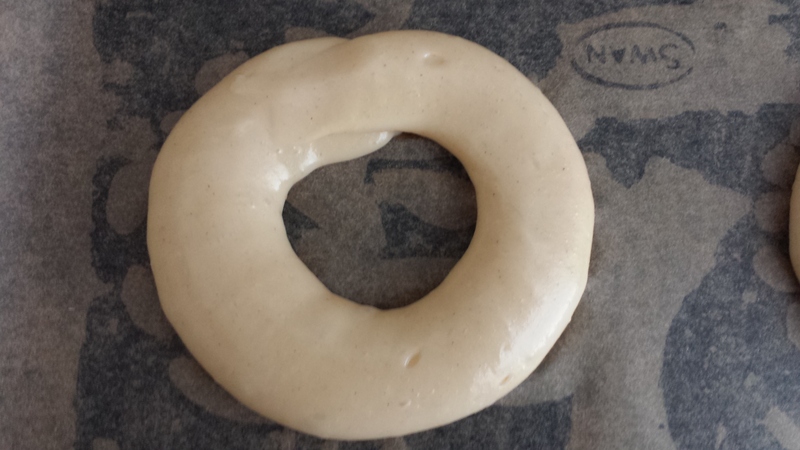 This recipe made 6 large rings. When you have piped the shape you want, dip your finger into water and smooth down any peaks that have formed at the end of piping. Bake on the middle shelf of your oven for 25 minutes, or until golden. 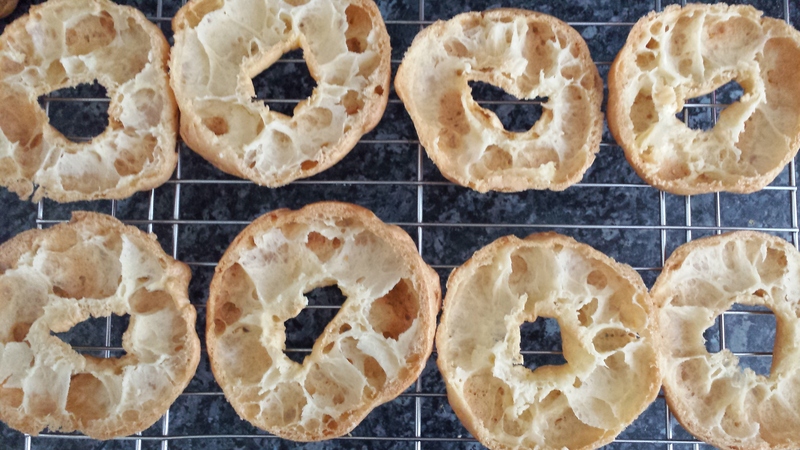 Remove from the oven, cut a small slit in each ring, and return to the oven for a further 5-10 minutes until crisp. This allows the steam to escape and dries out the inside of the pastry. When crisp, remove from the oven, leave on the baking sheet for 5 minutes, then cut in half horizontally. Leave to cool completely on wire cooling racks. You can fill and decorate these however you like, but the usual filling is whipped cream. I piped whipped cream into mine, spread a delicious caramel icing on top, and sprinkled butterscotch pieces (available from Asda) liberally on the icing. The icing was a quick and easy caramel sauce mixed with sieved icing sugar. They would be just as delicious with chocolate on top or any flavoured icing. 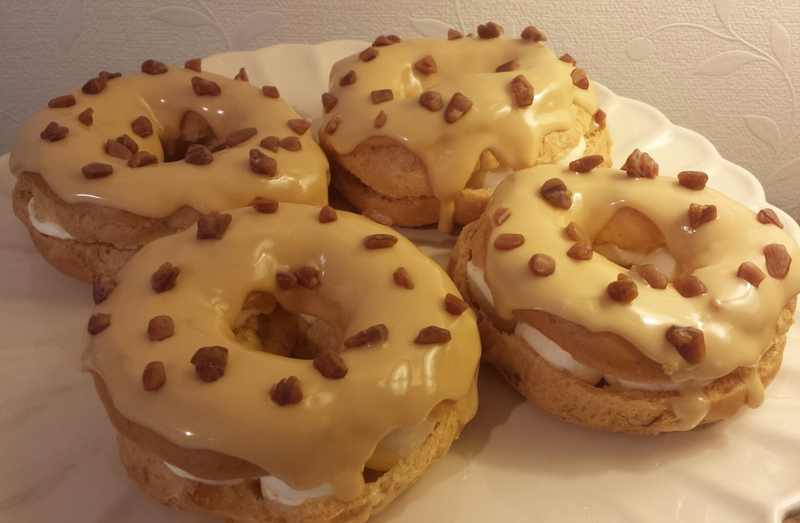 I’m entering these Choux Rings into the May 2015 Perfecting Patisserie Blogging Challenge, which is hosted by Lucy at BakingQueen74 and Kevin at The Crafty Larder. 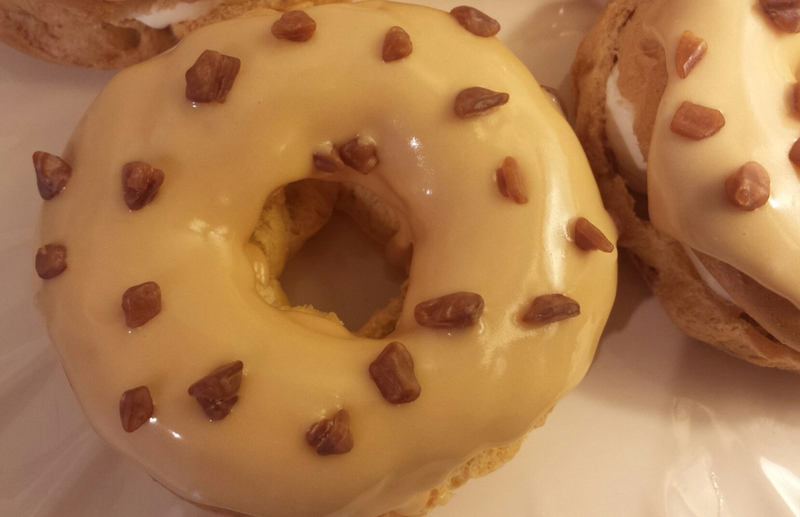 They look delicious, I love the caramel topping.